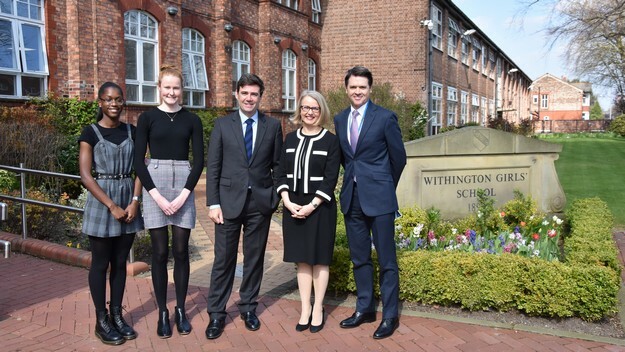 A visit by the Mayor of Greater Manchester, Mr Andy Burnham, to Withington on Thursday 28th March, gave our Senior School and Sixth Form pupils the opportunity to hear how they could play a role in the Mayor’s vision for Greater Manchester. 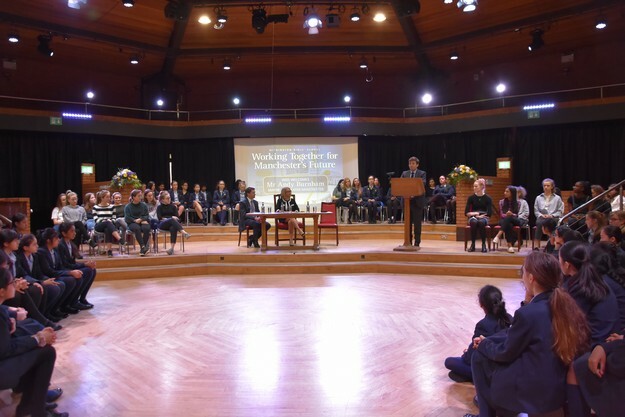 ‘Working together for Manchester’s future’ was the theme of the visit and the Mayor was given an insight into the partnership work undertaken by the pupils and staff of Withington. 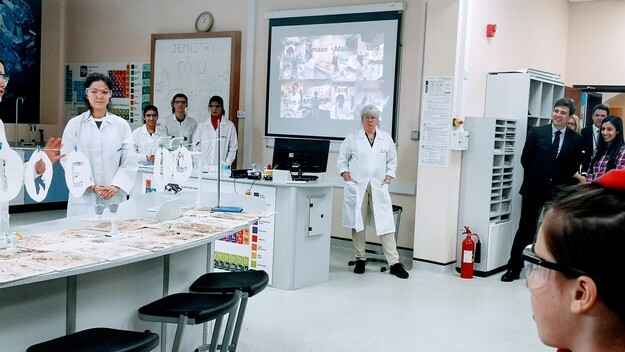 Highlights of the visit included 30 Year 5 pupils from Northenden Primary School participating in a ‘Young Chemistry Communicators’ workshop run by Withington Sixth Form students and Junior School pupils rehearsing a musical performance for local senior citizens planned for the school’s Citizenship Day in the summer term. 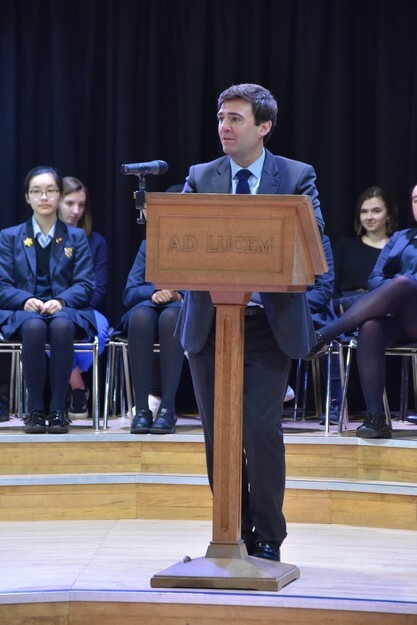 In his address to the assembled school Mr Burnham said: “Your generation gives me hope because I think you see the world differently. You don’t see differences between people as a negative, you see them as a positive. 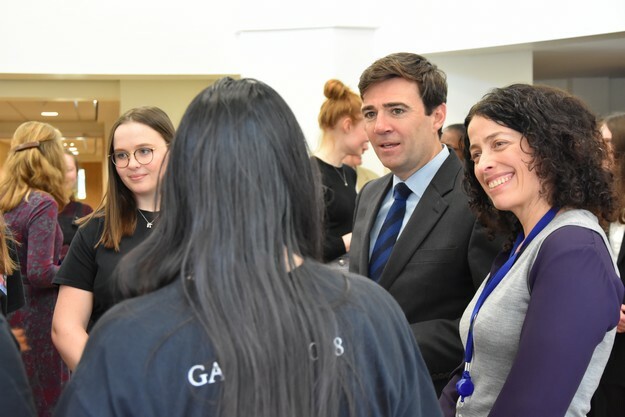 Your generation also has a clear understanding of the issues that affect us all, such as climate change, and you are demanding that something more is done quickly.” He mentioned that young people were key players at the Greater Manchester Green Summit earlier this week, where he had committed our region to going further and faster than anywhere else in the country, setting a date of 2038 to achieve carbon neutrality. 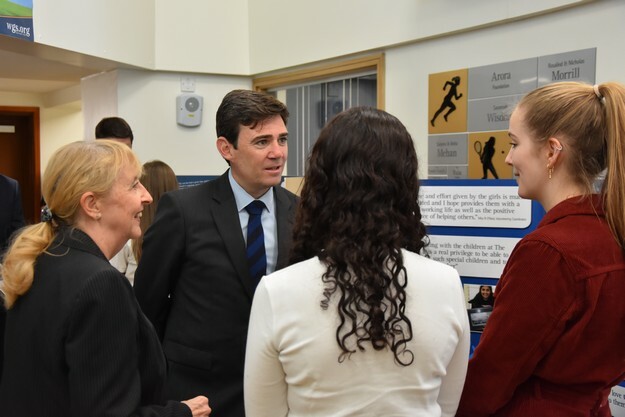 During the visit Mr Burnham was introduced to those responsible for delivering SHiNE, a Saturday morning programme of courses that has benefited over 500 pupils from 30 local schools over the last 11 years, and a Classics course that is offered to Year 5 pupils at Mauldeth Road Primary School. 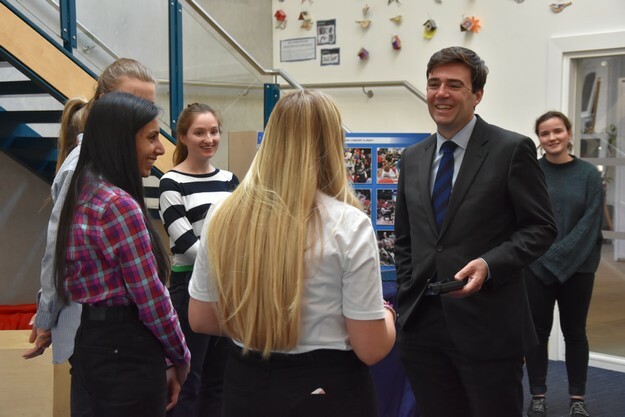 He also met members of Withington’s Eco Society, the WithGambia International Partnership team and a group of Sixth Form volunteers.